We met my brother, sister-in-law, Mom, and nephew at a local trick-or-treat spot the Saturday before Halloween to get a little "practice" in. 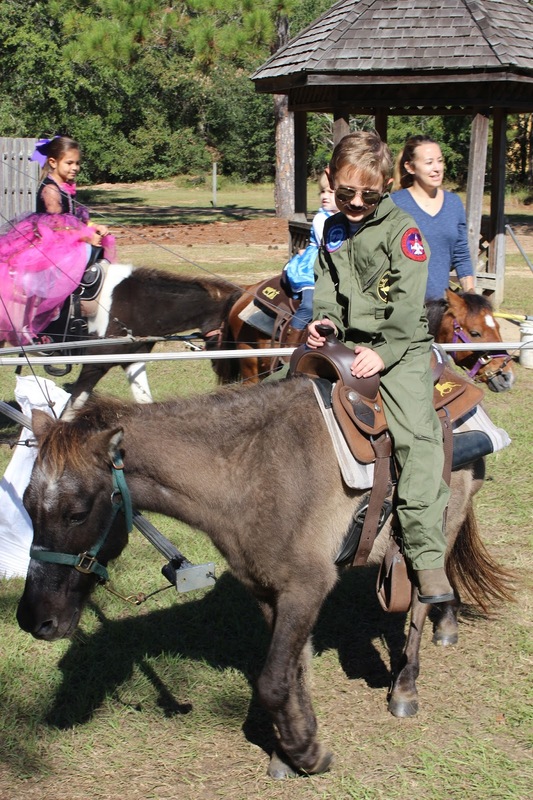 Really, I was looking for any excuse to use our costumes so that we'd get as many miles out of them as possible! Our local "museum" has a mini city set up and the kids are able to trick or treat at the houses and stores along the roads within the village. We've been to this museum a million times, and yet we'd never done this particular activity before. It was so much fun! We bought our wristbands, got a "passport" (the card that they used to stamp when we'd trick or treated at each stop), and hopped on the train to go to the village. 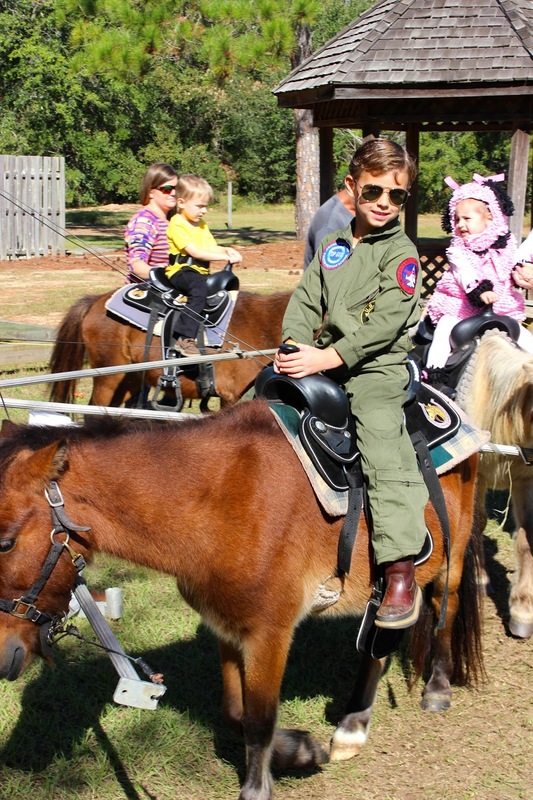 Liam looked super cute in his skunk costume and the boys THOROUGHLY enjoyed being in their Top Gun costumes. I'm telling you...for costumes that they really had NO clue about (they haven't seen Top Gun), they were so excited about them! About midway through, Will and I had to leave to go to one of his buddies' birthday parties so we left James with John, Kayla, Cacky, and Liam and headed to the house. One of the funniest parts of the day was when we were getting off the train back at the parking lot. I looked up and SANTA was working at the train station. And when I say Santa, I mean the real Santa! I whispered to him to be on his best behavior and his eyes were HUGE. This particular Santa is actually a real Santa Scout that works in our town (at this museum) to help Santa. The boys have sat in his lap and told him what they wanted a number of times and it was hilarious to see the wheels turning in Will's head. So fun! We had a GREAT time doing this and I'm sad I waited until they were 8 and 5 to go! Sadly, I feel like we are getting to be on the older side of Halloween activities. We will dress up and trick or treat for several more years, but this year I looked around and realized that James was one of the older ones at each activity. SO SAD!!!! I. Love. Those. Costumes!!! They pulled it off perfectly! 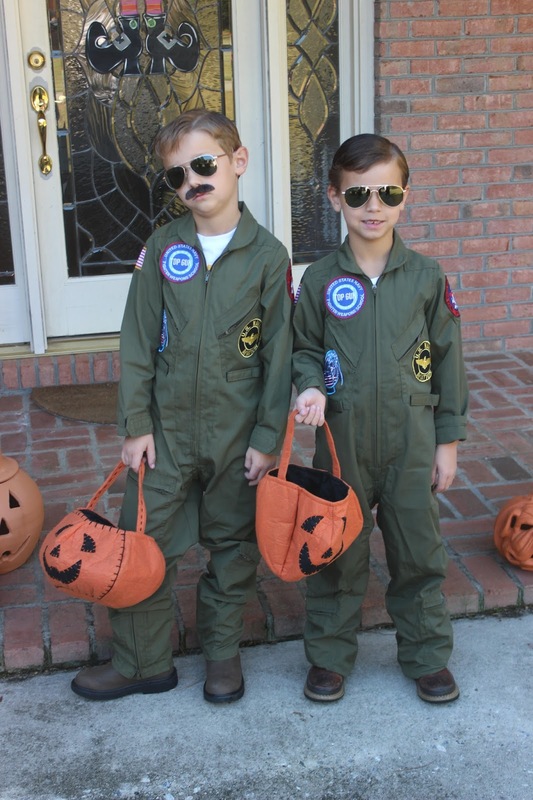 Where did you get these top guncostumes? Are you selling your old ones?